I express myself using the symbols that have become my creative vocabulary. 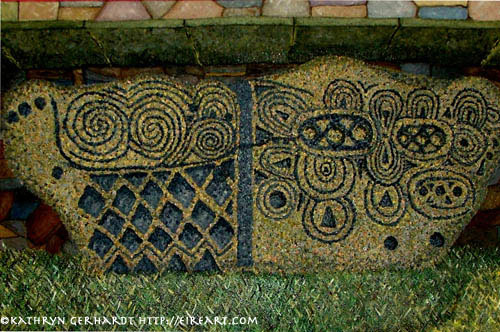 These symbols, found in the sacred mounds of County Meath Ireland -- Newgrange, Dowth, Knowth and Loughcrew -- hold great power and inspiration for me. 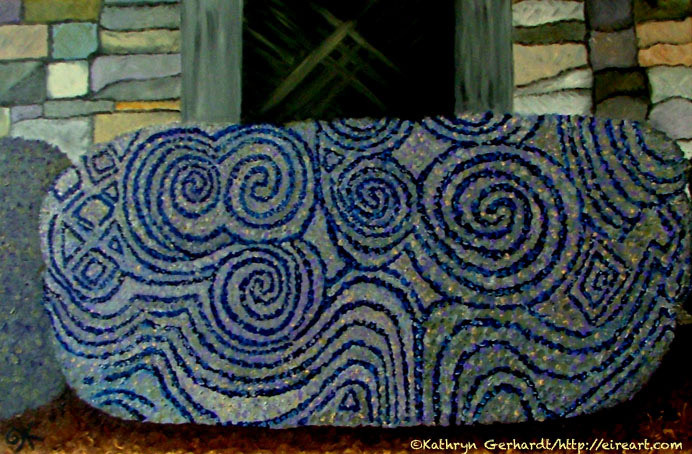 The energy given off by the stones and their carved spirals, circles and diamonds resonates deeply in me. 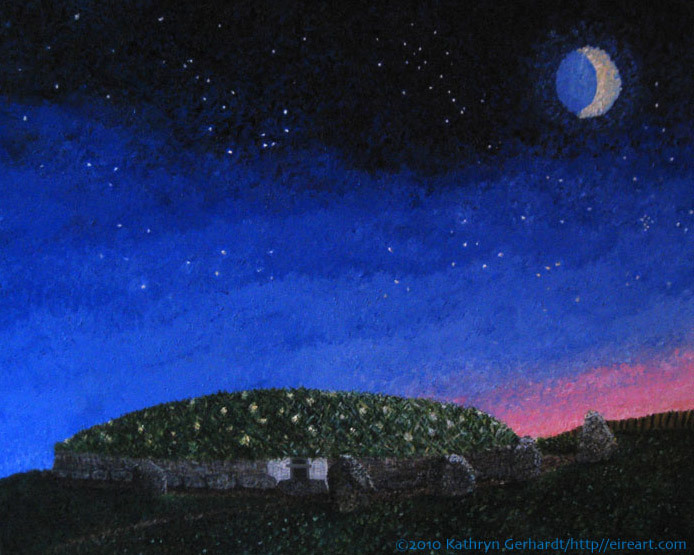 Newgrange, the most inspiring for me, was built for the sunrise on the Winter Solstice. The mound has a roof box over the entryway. 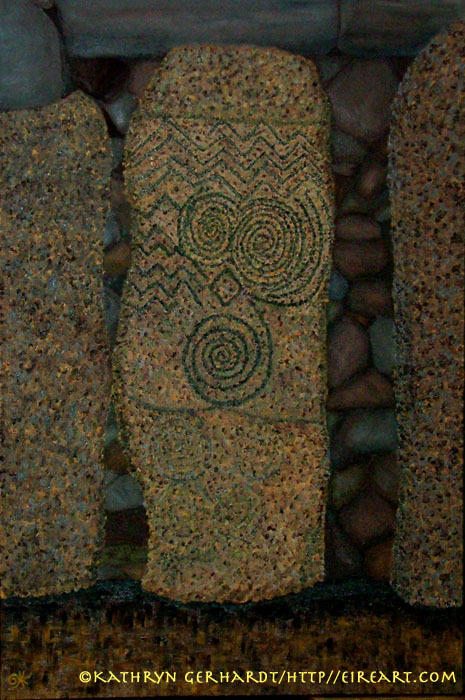 On the Solstice, when the sun rises, it shines into the box, lights up the passageway, illuminates the chamber and originally hit the triple spiral carved into one of the smaller chambers. The chamber is only illuminated on the Winter Solstice. This was how the people of the time knew the sun was returning. 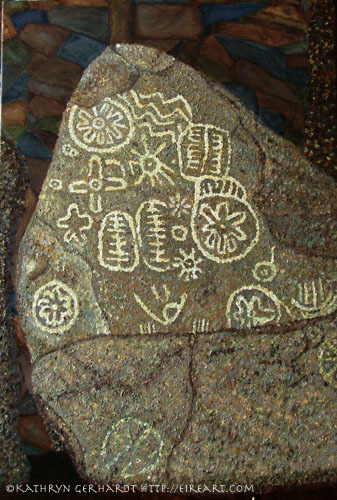 My work is based on the carvings on these ancient stones. Many experts and archaeologists have tried to decipher what has been skilfully carved into the stones, but I find, the more I look at them and work with them, their meanings flow and change. My work has evolved from simple designs, to representing myths, legends and landscapes, to illustrating songs, to an expression of emotion. I find working with the symbols helps to release much of what I am feeling at that moment and I find these feelings show up for me to examine on the canvas. Much of my work is painted on black to illustrate the light coming out of the darkness, however, I find when expressing great passion, the symbols want to be painted on bright white. In my current series, the actual stones and mounds, themselves, I find myself expressing my spirituality in my impressions of these beautiful and sacred stones. My hope is that my work captures just some of the light and energy given off by these sites and symbols and that they will resonate with whoever looks at them so that they can take a little of that energy with them.